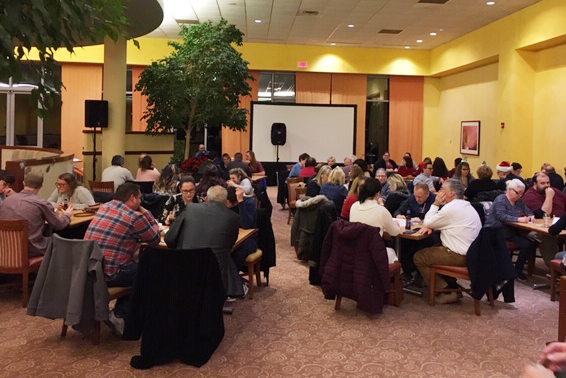 SOUTHBRIDGE, MA, December 17, 2018 – Harrington held its first-ever Trivia Night at the Southbridge Hotel and Conference Center to benefit the Southbridge Emergency Department Renovation project. Sponsored by Five Star Automotive Experts, the event drew 16 teams for a night of trivia, raffles prizes and entertainment. Eight rounds of questions, with bonus point opportunities in-between, was hosted by local philanthropist Rich DeYoung. Harrington Hospital’s Southbridge Emergency Department renovation is in the first of a four-phase construction process, which will add 2,400 square feet of new space while modernizing the existing 8,400 square feet. The project will add three more patient treatment rooms, renovate the waiting area, increase safety and patient access, upgrade technology and enhance the accessibility of patient care services within the footprint. Construction is expected to be complete by the end of 2019. Total renovation cost is estimated at $5 million; though more than a quarter of that amount has already been raised through individual and corporate donations and fundraisers, including the Harrington Heroes/A Fare to Remember gala which was held in July at Mechanics Hall. The first-place winners of Trivia Night were “The Tree Toppers” – Mary O’Coin, Terry O’Coin, Wendy Lennon and Greg Lennon. Second place went to “Useless Knowledge”, made up of Harrington Emergency Department Nurses Tracy DiGregorio, Patricia Leach and Heather LaFlamme, and Michael LaFlamme. Participants were also asked to bring a donation for Catholic Charities. A wide variety of full-sized toiletries and scarves/hats/mittens were collected to help support local families this holiday season. Harrington extends a special thanks to the staff at Southbridge Hotel for their hospitality and beautiful space, as well as Five Star Auto and the numerous individuals and businesses that donated raffle prizes. To learn more about the Southbridge ED renovation, visit harringtonhospital.org/give.